Have you ever wanted to completely remove a pesky mob from the game? Perhaps you're annoyed with Creepers? Or maybe you want to fix an exploit in your Mod Pack? Don't worry, this mod has you covered! This mod will allow you to list out all of the mobs you dislike in a configuration file, and when any of them try to spawn, they will be prohibited. You can add an unlimited amount of mobs to the list, including hostile and peaceful mobs. The configuration file is generated in /config/badmobs.cfg. To add a mob to this list, you have to write it's Savegame ID to the list of prohibited mobs. A list of these are maintained on the Minecraft Wiki. If you don't know the ID for a specific mob (like if it's from a mod), looking at the spawn egg will give you the ID. If the spawn egg does not show the ID, ask that mod author to extend ItemMonsterPlacer. New to 1.11.2 and onwards is the ability to restrict mobs from a specific dimension. If you add #number to the end of the entry, it will prevent it from spawning only in that dimension. For example, Squid#-1 will prevent squids from spawning in the nether. This mod also supports CraftTweaker! Q: The mob is not being removed? A: Make sure you are using the exact id. As of 1.12.2 mob IDs are now prefixed with domains similarly to how items and blocks are. So Zombie which was valid in older versions is changed to minecraft:zombie. Also please note that the IDs are case sensitive, meaning minecraft:Zombie will not work, it needs to be lower case. Based on convention all IDs should be fully lowercase, but some rare violations exist in other mods. Q: Will this mod work in Multiplayer? A: Yes, this mod will work on servers and single player worlds. If you are a server administrator, you can set this mod to Server Mode which will make this mod a Server Mod, meaning players can connect to your server without this mod installed! However, players will need the mod client side to see changes to the spawn egg tooltop. Q: How does this prevent spawning? A: When a mob tries to spawn within your world, if it is on your list of prohibited mobs, it will not be able to spawn. By default, this mod will also kill that mob and remove it from the world file, note that the mob will NOT drop items or experience, nor will any players see the mob spawn in the world and die. The killing of mobs can be disabled in the configuration file. If killing is disabled, the mobs will be saved in the world data, but will not spawn. When the mod is removed, or the mob is no longer on your list of prohibited mobs, all previously prevented mobs will spawn simultaneously. Q: Will this work with Golem type mobs, like the Snow Man? What about Spawners, or Spawn Eggs? A: Yes, this will prevent mobs from spawning, even if they are spawned from a block structure, Mob Spawner, or Spawn Egg. 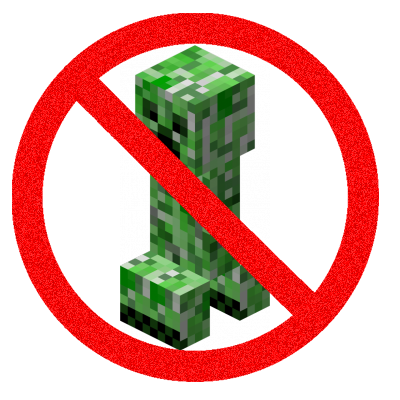 This mod will prevent a prohibited mob from ever entering the world, regardless of how it is done. This mod looks like EXACTLY what we need. Only issue, we are running all 1.7.10 mods. Why doesn't this config work? the config button is shaded out, it deosnt work. is there any other way to make the mod work? Can it also make mobs rarer? Some of my mods don't have options in the configs to make the mobs rarer. The mod won't let me open up the config settings. I have not yet tried this, though will likely have done so before this comment is read. I am just wondering if mob spawns can be reduced rather than suppressed entirely? I have LycaniteMobs installed and am swamped with mobs all the time, it's virtually impossible to leave the safety of an enclosed and lit up area without being set upon from all sides and in massive numbers. I did tweak the LM settings but it doesn't seem to have resolved things and i'd rather not have to remove entirely. OMG, Thank you so so so much. For some reason in my MC World there are a million squids in the ocean and they would cause my game to keep freezing for 1 or 2 seconds every 10 seconds and I couldnt fix it. Im about to try it out on 1.12.2. This mod is a must-have for packs that include multiple new dimensions, I'm glad I can finally have some control over things spawning where they really shouldn't be. I've tried several different configurations using the ID found on the spawn egg, even disabling the mob yielded no results; I'm sure I've just done something wrong, but after about 2 hours of troubleshooting the issue I'm stumped as to what the issue might actually be. EDIT: I disabled named entities and turned on the "aggressive" option and this seems to have worked. I don't believe the mobs themselves were named, so I'm not sure if the other change was what actually fixed this issue. Hi, I was curious, your mod has 1.13 tagging, but obviously no releases for 1.13, is this not intended? There actually is a 1.13 version of this mod, however the file is not currently public. Forge has beta versions of 1.13 available, however it is not ready for modders to use yet. I see, that makes sense. Just wanted to be sure. Is this a Forge mod? Yes, you should assume all MC mods on CurseForge use Forge unless it specifically mentions Fabric or other loaders. Are we able to include more than one dimension on the blacklist? #0 #-1 #111 ? Do you know the ID of a blueslime from tinkers construct? For future reference, the ID will be listed on the spawn egg for the mob for convenient lookup.